• the Priority Project «Development of Export Capacity of Russian Education». State accreditation – state accreditation aims at the recognition of the quality of higher education as corresponding to the Federal State Educational Standards (Federal Law “On Education in the Russian Federation”. 29.12.2012 N 273-ФЗ). State accreditation is conducted by the state federal body the Federal Service of Supervision in Education and Science. State accreditation is mandatory for all HEIs. As a result of successful state accreditation the HEI is awarded a certificate of state accreditation for a period of six years. In case of non-compliance with the Federal State Educational Standards, Rosobrnadzor issues an ordinance or orders an unscheduled inspection, suspense or withdraws accreditation. Besides accreditation there are procedures of independent quality evaluation in education in Russia, which assess the quality of students’ performance and the quality of teaching. Independent education quality evaluation is carried out regarding educational institutions and study programmes offered by them to assess the compliance of training with the person’s demands whose interests are taken into account. Independent education quality evaluation is executed to render those persons assistance in selecting the educational institution and the study programme, to enhance competitiveness of the educational institutions and their study programmes in the Russian and international markets. The examples of Independent education quality evaluation can be different projects, such as Federal Internet Exam in the Sphere of Professional Education which is aimed at the external assessment of students’ learning outcomes in order to evaluate their compliance with the Federal State Educational Standards (www.i-exam.ru). Another project is the Open International Internet Olympiad for higher education students etc. Educational institutions can acquire public accreditation in various Russian, foreign and international institutions. Public accreditation is the recognition of the level of educational institution’s activities conforming to the criteria and requirements of Russian, foreign and international institutions. The procedure of public accreditation, ways and techniques of evaluation and also rights given to the accredited educational institution is set by the public institution to be executing public accreditation. Professional-public accreditation of professional study programmes is the recognition of quality and standard of graduates training having mastered such a study programme at a particular educational institution meeting the professional standard requirements, labour market demands for workers and employees of the corresponding specialization. It is a voluntary procedure conducted by public (non-governmental) bodies or professional associations. Public accreditation aims at enhancing the quality of education, promoting the development of HEIs, and recognizing their achievements on national and international levels. • in distributing admission quotas. These data may also be relevant for promoting the image of a HEI in the international arena, thus facilitating the cooperation between HEIs at the national and international levels. Thus public accreditation is viewed by HEIs as one of effective mechanisms of educational quality management. In May 2018 the Ministry of Education and Science of the Russian Federation was reorganized and two independent bodies were formed: the Ministry of Education with the responsibility for preschool and secondary school education, and the Ministry of Science and Higher Education of the Russian Federation. At the moment the Ministries are developing their structure, functions and staff. By the Decree of the Government of the Russian Federation from July 2018 the Federal Service for Supervision in Education and Science (Rosobrnadzor) was separated from the Ministry of Education and is now an independent state body of executive power. Rosobrnadzor is subordinated to the Government of the Russian Federation. Rosobrnadzor carries out the state accreditation of study programmes for compliance with Federal State Educational Standards. Rosobrnadzor carries out the function of federal control over the performance and quality of delivered programmes by educational institutions. It also supervises the regional education authorities, licensing in the sphere of education and nostrification of foreign documents of education. In the Russian Federation education is subdivided into general, professional, further education and vocational training that ensures that the right for lifelong learning is exercised. Bachelor degree programmes focus on basic training and courses relevant to the degree programme and the fundamentals of the subject. Bachelor programmes are offered virtually in all fields of study with few exceptions, for example, medicine. Bachelor degree programmes are of general scientific and professional character. Bachelor programmes offered in Russia have a standard duration of four years. Bachelor’s degrees are awarded to students upon successful completion of undergraduate studies. Graduates obtain the Certificate of Bachelor in a related field of study: for example, Bachelor of Economics, Bachelor of Law, etc. Bachelor’s degree holders may enter the workforce immediately and take up jobs requiring applicants to have higher education. Bachelor programme graduates may also pursue a Master’s degree in their major or related study field, or apply to a Master’s degree programme in a different discipline from that of their Bachelor’s degree. Master degree follows the Bachelor degree level. The length of Master degree programmes delivered by Russian HEIs is two years. Master level programmes offer students a deeper and a wider perspective on related fields of study, and in-depth specialization in their majors. Bachelor level programmes are more practice-oriented; Master programmes provide students with competencies they will need for their future research or teaching activities. Academic studies in the specified majors lead to the Specialist’s Degree. It is a traditional form of Russian higher education which had existed before Russia joined the Bologna Process and is implemented today. Specialist’s degree programme comprises basic education with in-depth specialist training in the chosen area. Since September 1, 2013 postgraduate studies has been the third level of higher education. A postgraduate student receives the academic title of Candidate of Sciences when he/she passes qualifying examinations for the degree and defends a thesis. In the Russian Federation HEIs are represented as academies, institutes and universities. The universities are categorized into federal, flagship and national research universities. They are leading higher education institutions in Russia. The aim is to develop best practices and models in the sphere of management, methodology and content of education. Federal universities train highly-qualified staff in priority areas of research, production and economy in accordance with the long-term plans of social and economic development of educational institutions in the regions and federal districts of the Russian Federation (10 HEIs were assigned this status). National research universities have a goal of training highly-qualified staff in priority areas of research and technology (29 HEIs were assigned this status). Since 2015 the Ministry of Education and Science has been implementing the project «Development of the System of Flagship Universities». Flagship universities are universities established in the region on the basis of emerging existing higher education institutions (33 HEIs were assigned this status). Such a university is oriented at developing the support of the Russian region by providing the regional labour market with highly-qualified staff, solving current problems of regional economy and implementing educational and innovative projects together with the region and its enterprises. Two higher education institutions – Lomonosov Moscow State University and Saint Petersburg State University – have a special status and the right to award their own diplomas. These HEIs can also develop and approve educational standards of their own at all levels of higher education. In the Russian Federation the requirements for the quality of education and training are set at the state level by the Federal State Educational Standards (FSES). The FSES is a set of coordinated state educational standards and requirements binding for all state accredited educational programmes of primary, basic general, secondary, secondary vocational education and higher professional education. FSES shape the contents of education and establish the required quality of the content of education (curricula and syllabi); the teaching and support staff; the information provision of the teaching and research process (modern sources of information and different types of available support – printed and electronic – which correspond to the content of course programs as well as means of information transmission, storage and use); the actual knowledge and skills of graduates (minimum requirements in regard to the level of knowledge and skills of graduates). The State Educational Standards are developed by leading higher education institutions, representatives of the academic community, and employers, whose work is coordinated by the Ministry of Education of the Russian Federation. Higher educational institutions belonging to the categories “the federal university” or “the national research university”, and also federal state educational institutions of higher education approved by a special Order of the RF President have the right to develop their own educational standards at all levels of higher education. The requirements of such educational standards for the conditions and the learning outcomes of the delivered programmes cannot be below the corresponding requirements of the FSES. 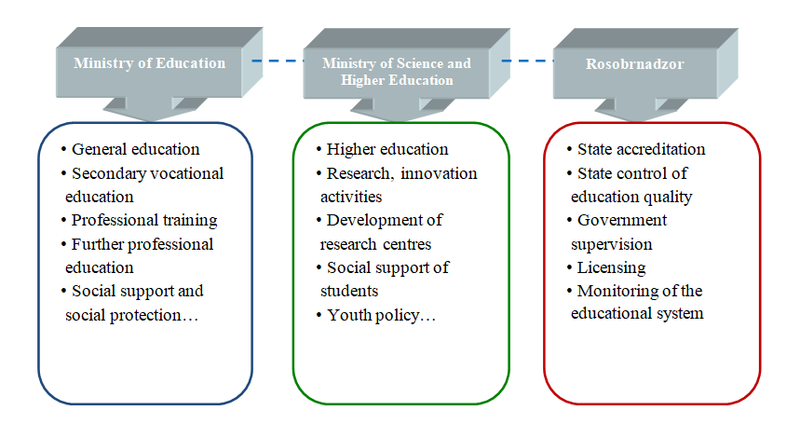 Since 2011 Russian universities have been facing the challenge of the development and implementation of new competence-oriented educational programs, including the addition to the list of professional competencies, the development of new curricula, working programs of subjects, funds of assessment tools. Herewith one of the main requirements is to adjust educational programs to the needs of the labor market (employers). Today Russian employers have the opportunity to participate actually in every stage of organization and emmplientation of learning process, including participation in the development of outcomes requirements, learning content, in network training, final examinations, giving masterclasses, workshops. • the educational institution does not adjust the monitoring of students’ progress and assessment of SLO to the terms of their future careers. On January 22, 2013 the Russian Government issued the Decree N 23 "On the Rules of the development, approval and implementation of occupational standards", which determined the development process and approval of occupational standards (OS), the general order of their development and use. c) in the process of developing Federal state educational standards of professional education. In 2015 the Ministry of Education and Science of the Russian Federation developed and issued "Methodological recommendations for developing educational programmes of higher education and professional retraining programmes in accordance with occupational standards". More and more employers are involved by HEIs in the process of developing or updating the list of competences and learning content. Due to the statistics on November 2018 the number of occupational standards approved by the state has grown up to 1159. To make this cooperation effective the needs of employment (occupational standards) are translated into a language that can be understood in education sphere. The goal is to translate the language of actions in OS to the language which will enable education professionals to plan and deliver learning programs. One immediate step that can be taken by HEIs is to develop new lists of competences that describe what people will be able to do at the end of educational programs. "Methodological recommendations for developing educational programs of higher education and professional retraining programmes in accordance with occupational standards" contain the detailed algorithm and instructions/recommendations for HEIs to organize the work on development or updating educational programs linked with OS. 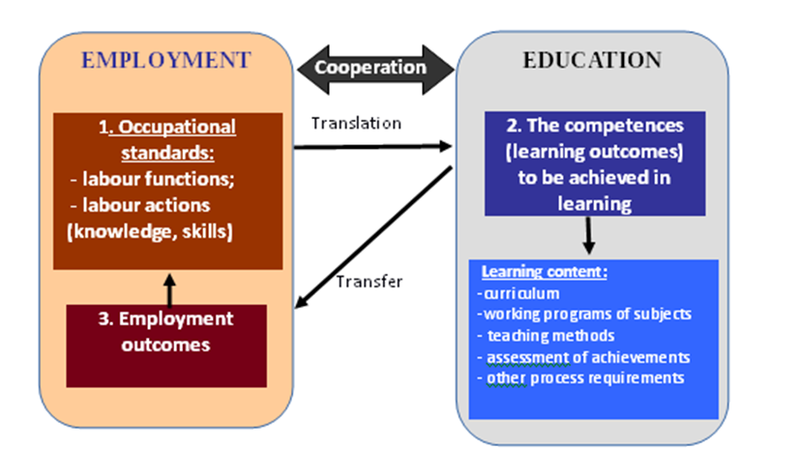 The Scheme in Figure 2. presents the entire process of linking occupational standards and students' learning outcomes (competences) including the subsequent updating of assessment tools, the content and other parts of the educational program.